Editors Note: I’m putting this up early for two reasons – firsty, I might not have a chance to update closer to the weekend, and secondly, this is to the benefit (hopefully) of those attending Steamfest. Not much good if it goes up the day before! It is of course, that time of year again! Of course, I do not refer to Christmas, although it may as well be for those who will make the annual pilgrimage to Maitland for this year’s Hunter Valley Steamfest. Of course, any self respecting railfan (I’m sure they exist somewhere) will know all about the various steam-related activities going on in “The Valley” over the weekend (although, if you don’t, take a quick look here), although for infrequent visitors, it might be difficult to pick out some of the other companies that operate in the Hunter Valley. Here’s a brief rundown on some of the companies and their locomotives that should play a part in any plans to attend festivities. Perhaps the most “unsung” operator in the Hunter Valley, CityRail will be an essential service for those looking to get around without a car (and with traffic in the Maitland area chaotic at the best of times over the rest of the year, the CityRail services might not seem a bad idea). CityRail normally operate an hourly, all stations service between Maitland and Newcastle in both directions, using their fleet of Hunter and Endeavour railcars. Over the Steamfest weekend, service frequency is increased to every thirty minutes. Given that most stations offer a decent angle on both mainline and coal traffic, there is no reason to fight the traffic if one plans to photograph in the Maitland to Newcastle corridor. In addition to the normal trains, CityRail are also operating a number of special “parallel run” trains for the benefit of photographers. 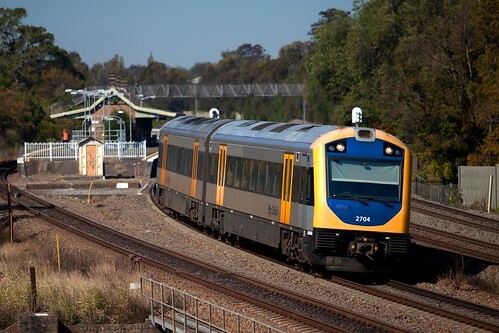 While it is quite easy to focus all of the attention on the passenger trains of yesterday, it is always worth paying attention to the passenger trains of today – if travelling up from Sydney, CountryLink operate a number of services to/from Maitland that are faster, more comfortable and more convenient than their CityRail counterparts. 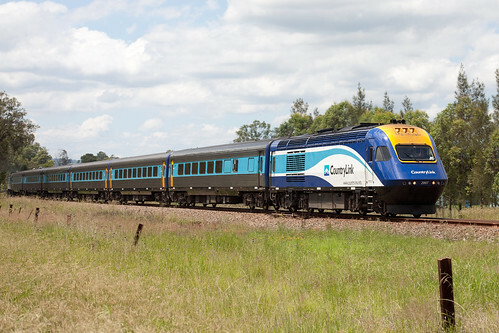 When taking photographs between Waratah and Maitland, keep an eye out for the CountryLink fleet of XPT (North Coast services) and Xplorer (North-Western services) trains. CountryLink operates three XPT services per day in each direction through the Maitland area, as well as a combined Xplorer service to Moree and Armidale. The morning XPT from Sydney is a daylight service to Casino, passing through Maitland at 0959. The following train is the Northern Tablelands Xplorer service at 1247, followed by the Grafton XPT at 1418, with the final train the overnight XPT service to Brisbane at 1854. In the return direction, the train from Casino is at Maitland at 0407 (probably a bit early for even the hardiest of enthusiasts), followed by the Grafton train at 1359, then the Xplorer from Armidale and Moree at 1413 and finally the Brisbane service at 1828. The Xplorer service to the North-West is a combination of the Moree and Armidale trains, which separates at Werris Creek (with the front cars continuing to Armidale, and the rear cars going to Moree). In times of service disruptions or trackwork, often the train will run as a single Xplorer set of 3-6 cars, which, while uncommon, is always worth photographing! At one point, Pacific National trains were more frequent than the CityRail passenger services through Maitland. While PN have seen their competitors nipping at their heels over the last year or so, they still carry a very strong Hunter Valley presence. In addition to coal, they also transport grain, flour, ore concentrate, steel, sugar, cement and general freight through the area. Pacific National have the largest fleet of any coal operator in the area, with trains running to and from coal loaders that range from the local area (Bloomfield and Pelton collieries) to locations as far north as Stratford (located on the North Coast Line), north west to Werris Creek and Gunnedah (over the Liverpool Ranges), west to Ulan and south to Teralba. The fleet of locomotives and wagons used on coal traffic is as diverse as the locations they serve, with members of the 82, 90, 92, TT, WH, EL and CF Classes all used. The 82 class are used with 100t (gross) hoppers to serve locations such as Stratford, Werris Creek and Gunnedah, although they are also used in conjunction with the larger 120t (gross) hoppers to serve the various mines in the Hunter Valley basin. Limited by their weight, the 90 Class are exclusively used on Hunter Valley coal operations, and are typically operated with the older 120t hoppers to the mines in the Singleton/Muswellbrook area, as well as along the Ulan Line. The 90 Class are also used to serve the coal loader at Teralba, along the line back to Sydney. 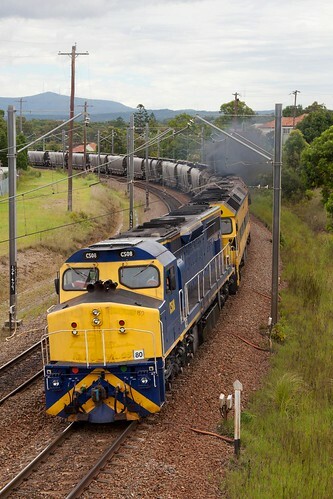 The General Electric powered 92 Class were originally ordered to swing between heavy coal and fast intermodal freight operation, although the class have more or less settled into dedicated coal haulage since their introduction (with the exception of 9211 and 9212, recently used on trials and crew training for Brisbane to Melbourne operation). Initial TT Class deliveries from EDI were fitted with removable ballast pods to increase their weight (and thus, traction). The TT Class of locomotives are therefore split into two separate “sub classes”, with those numbered in the “100” series not fitted with ballast pods (although, to further confuse enthusiasts, some of the later TT Class delivered that were not numbered in the “100” series were never fitted with these pods…). 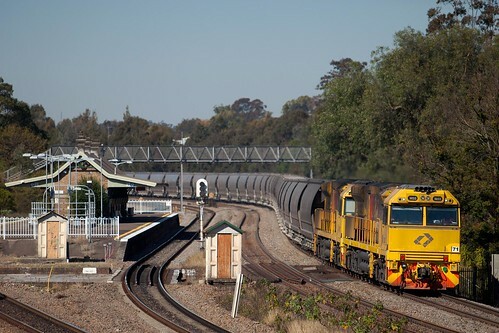 Those TT Class locomotives fitted with the ballast pods are limited to the Hunter Valley area (Newcastle to Muswellbrook and Ulan), while those without the ballast pods are used almost exclusively with the 120t hoppers to mines in the Gunnedah Basin. The TT Class were the first class of PN locomotive to use ECP braking (a new braking method that ensures the brakes on all wagons apply immediately, as opposed to the traditional brake-pipe based method). 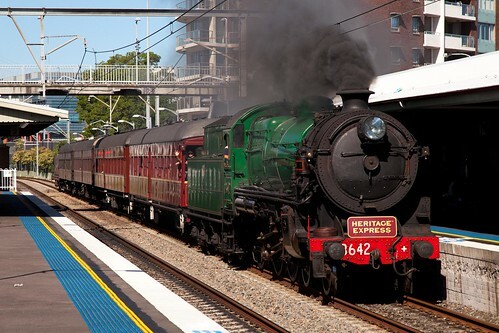 Like the WH Class, the EL Class locomotives are not owned by Pacific National – they are instead owned by CFCL Australia, and are leased by Pacific National for use on the former South Maitland Railways line to Cessnock. 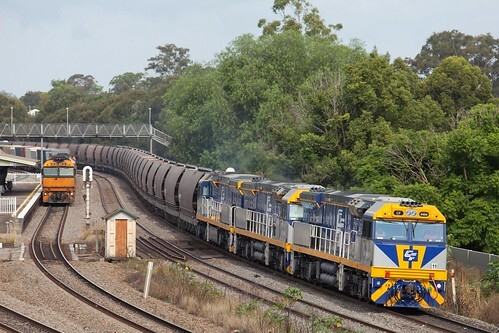 Operating in pairs, the EL Class haul 76t (gross) NHTF coal hoppers to the Austar loader at Pelton and back again. On any given day, there may be up to two Pelton trains operating, although typically only one train is on the branch at a time (although a second train may traverse the branch if the first train is already loading at the coal loader, due to the provision of a triangle at the end of the line). Finally, the newest locomotives used by Pacific National are six leased CF Class locomotives, also leased from CFCL Australia. These locomotives are in the same pool as the 90/92 class locomotives, working to the mines in the main Hunter Valley area, usually with the older, non-ECP 120t hoppers. Like the WH Class, they are fairly uncommon, so if you do see them, make sure to grab a shot! As mentioned previously, Pacific National haul more than coal through the Hunter Valley. They also operate a number of intermodal and steel services between Brisbane and Sydney (with eventual destinations of Adelaide, Melbourne and Port Kembla). These services are dominated by the stalwart NR Class locomotives, although they are occasionally supplemented by AN Class (and less commonly, DL and 81 Class). 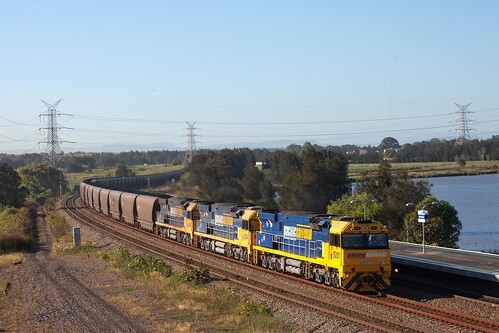 Although less common than their cousins in coal, PN’s Bulk division operates a variety of traffic through the Hunter Valley with a wide variety of locomotives and rolling stock. Locomotives used include the 81, BL, G, 48, 80 and X Classes, mostly hauling grain for export through Newcastle Harbour, although other commodities carried include cement and sugar (to/from Grafton, on the North Coast), containerised ore concentrate (from Hermidale, in western NSW) and flour (from the Manildra Group mill at Gunnedah). While these trains are far less common than the coal traffic, they often add a splash of noise and colour and are always worth keeping an eye out for. Second only to Pacific National, QRNational have been continuing to expand their operations since beginning Hunter Valley coal haulage in 2005. Unlike Pacific National, QRNational use only two classes of locomotive for coal work – the 5000 Class (12) and the newer 5020 Class (19). For the most part, QRNational trains are hauled by pairs of locomotives, either two 5000 Class, two 5020 Class, or one of each. All of the 5000 Class locomotives are painted in the older QRNational “eagle” scheme, although since the public float of QRNational from state government to public ownership, all of the class have had the new QRN logos applied. The newer 5020 Class are all painted in the modern “corporate” QRNational yellow scheme, and are quite eye-catching (even when dirty). Unlike Pacific National, QRN do not operate north of Muswellbrook. In addition to the mainstream coal haulage, QRNational also hold a contract for the movement of coal between Duralie Mine and Stratford Washery on the North Coast Line (although these services do not typically operate on weekends). These trains previously operated with a mix of 421, 422 and 423 classes, with the 6000 Class introduced more recently. At the time of writing, QRNational and UGL are re-gauging a pair of 2800 Class locomotives from the QR narrow gauge network for use on these services to increase reliability and crew comfort, and decrease noise for local residents. 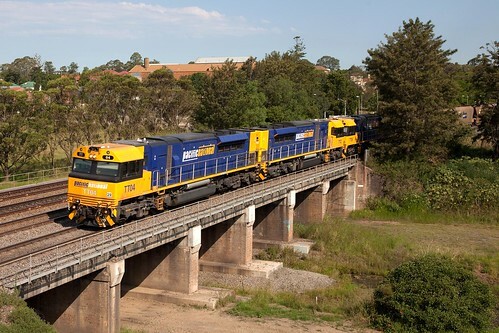 As well as the daily coal trains running to and from port, QRNational also operate interstate freight services between Brisbane and Melbourne using a fleet of leased LDP Class locomotives, supplemented by older locomotives (including the G, CLP, CLF, X, 421 and 422 classes). These services typically pass through the lower Hunter Valley in the morning on a Sunday, becoming another “wildcard” for the Steamfest photographer. 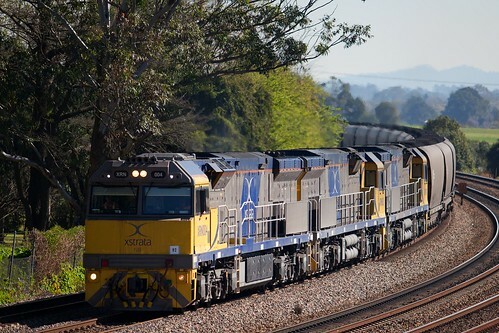 Freightliner is only a recent entrant to the Hunter Valley coal haulage market, having signed on with Xstrata Coal in 2009, with operations commencing in late 2010. Xstrata purchased a total of 20 “XRN Class” locomotives from UGL, as well as a large number of 120t gross coal wagons from Bradken. Freightliner then crew and operate the trains as their own, loading at the various Xstrata loading points and unloading at port. 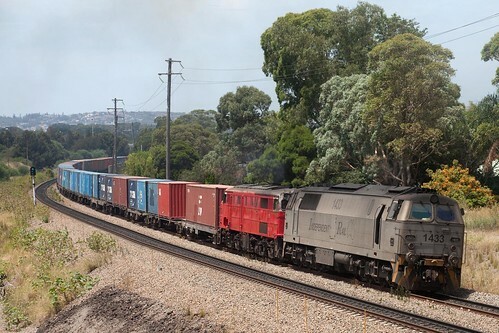 As well as operating coal trains for Xstrata, Freightliner run a container service between Port Botany and Wee Waa. These services are typically rostered from a pool of leased CFCL Australia GL Class locomotives, although HL203 (also owned by CFCLA) and members of the 423 Class (owned by QRNational) have been seen recently on this service to supplement the GL Class locomotives. A fair warning for those who might get distracted from the spectacle of steam by the lure of this container service – given the traffic and the roads in the lower Hunter Valley, this train is a very difficult proposition to chase until you get north of Muswellbrook… which means missing out on a large chunk of steam action! Like Freightliner, SSR are a recent entrant to the Hunter Valley coal market, having signed up with Centennial Coal. Perhaps the best known (and easiest to photograph) coal train that SSR operate is their Newstan rake. 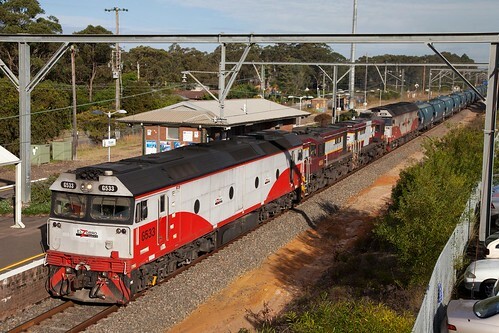 This train operates between Newstan (located near Fassifern) and Newcastle, using the SSR liveried G and C Class locomotives (although when one of the “big” locos is unavailable, smaller power has been known to assist in the form of B, S, GM, 42, 47, 48, 49, 422 and 442 classes, amongst others). Perhaps the best place to photograph this train is on the mainline between Broadmeadow and Kooragang Island, especially in the afternoon as lighting conditions are quite favourable. The train will often make a few “cycles” a day, depending on demand, so if one is patient, it’s like shooting (bright yellow) fish in a barrel. The other two coal trains that SSR operate for Centennial Coal use the much more modern CEY Class of locomotives, built by UGL and owned by Centennial Coal. They are painted in a variation of the SSR livery with green replacing the black. As these two rakes tip either in Newcastle or Port Kembla (dependant on demand), they are much harder to pin down. 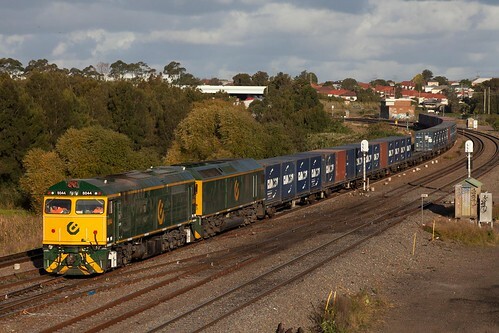 Qube Logistics own both P&O Trans Australia and South Spur Rail Services, both of which operate a variety of traffic within the Newcastle area, using a very diverse mix of motive power. Locomotives used vary from the modern 1100, VL and RL Classes to older locomotives including the GL, 80, 442, 422, 48 and 830 Classes. Perhaps the most (or least, depending on your opinion of the new 1100 Class locomotives) desirable train to photograph at the moment is 4112 container freight from the Toll siding at Carrington to Port Botany. This service typically departs Carrington around 0930 on Monday – Saturday , passing through Broadmeadow and on to Sydney. The typical roster for this train is the two operating 1100 Class locomotives (1101 and 1103) back to back. More recently, CFCL Australia owned FL220 has also been added to this train to assist. Another interesting train to photograph (also on the Saturday) is 1443 freight from Port Botany (or Cooks River) to the Mountain Industries siding at Kooragang Island. I am told that on a Saturday, it is not unusual for this service to terminate at Broadmeadow though, so perhaps the best location to photograph this particular service would be between Broadmeadow Yard and Sydney. Typically the locomotives from 1443 will be used to run a containerised coal service on the following Sunday, recently loading at Werris Creek and returning to Kooragang Island in the late afternoon on the Sunday. As well as containerised coal, Mountain Industries have recently contracted Qube to operate a containerised grain train from north western NSW to their siding on Kooragang Island, although at this stage, no concrete running times can be pinned down – the “hoppers” are a fairly distinctive 20ft, cream coloured container with “Mountain Industries” lettered along the side. In addition to the container services for Mountain Industries and Toll, Qube operate a container service between Narrabri and Port Botany, as well as a containerised ore train between Newcastle and Cobar. Again, timing for these services is sporadic at best (to add insult to injury, they normally arrive and depart in the dead of night), but they are worth keeping an eye turned trackside, “just in-case”. Another recent visitor to The Hunter Valley is El Zorro Transport Solutions – having signed a contract with AWB Grainflow in 2008 for the haulage of export grain traffic. At the time of writing, El Zorro operate one grain rake in North-Western NSW, using a mix of motive power including (but not limited to) members of the VL, EL, GL, C, G,442, 80, 45, and 48 classes. Formerly known as Lachlan Valley Rail Freight (LVRF), IRA currently operate a pair of container services to the Hunter Valley region. One runs to/from Narrabri, in the north-west of the state, while the other services the container siding at Sandgate. Typically, CFCL Australia leased motive power dominates these services (GL and EL Class locomotives), although the ex Danish MZ Class (as well as the more local 44 and 47 Classes) have been known to appear from time to time. Unfortunately, unless their trains have been delayed, they typically pass through the lower Hunter Valley during the hours of darkness.